Teacher: Larene Smith. 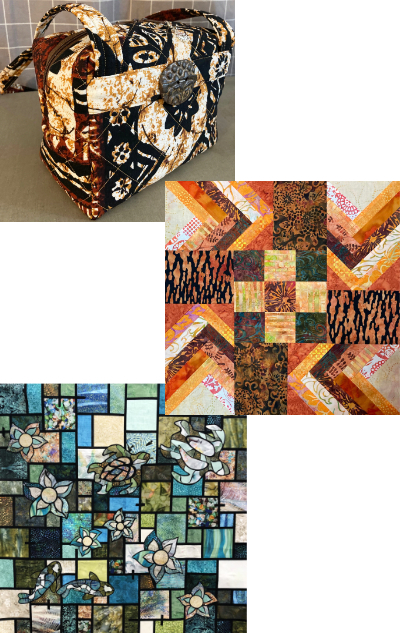 (All Levels) Get help with an ongoing quilting project or start a new project using one of Larene’s original quilt, tote or bag patterns...or bring your own! Larene excels at problem solving and answering students' questions and is delighted to share ideas with her students who can work on any quilt project with her expert guidance. Larene is featuring a "block of the month" using 2 1/2" pre-cut strips to make her original Sensational Strips quilt. She is constantly designing and is known to surprise her students with new projects. A supply list will be emailed.